Various attempts for transmitting messages overland date back to millennium before Christ, and include an ingenious uses of homing pigeons, heliographs (mirrors), flags, torches, and beacons, but none of them gained wide currency. One of the earliest known today examples is described by the ancient Greek tragedian Aeschylus (523 BC-456 BC), in Agamemnon—when Troy was captured, the news was spread by lighting fires in ten signal towers specially built to announce the victory. In the 4th century BC the Alexandrine engineers Cleoxenus and Democleitus invented the pyrsia, a system based on two signalers each with only two torches which, according to the way they were held, transmitted the letters of the alphabet. Many centuries passed before the European inventors rediscovered the ancient secrets of communication. In 1499 the German Benedictine abbot and polymath Johannes Trithemius reinvented the ancient pyrsia in his Steganographia. In 1646 the Jesuit polymath Athanasius Kircher published his treatise Ars Magna Lucis et Umbrae, which in addition to various inventions such as the projector, described a telecommunications experiment that he called cryptogamia catoptrica, again based on the principles of the pyrsia. Due to the invention of the telescope, as well as many discoveries in physics, especially in acoustics, made in the beginning of 17th century, it was a matter of time communication systems, based on them, to be developed. It seems one of the pioneers in the both areas was the Enlightenment natural philosopher and polymath Robert Hooke, considered as оne of the most brilliant and versatile figures of his time. 'tis not impossible to hear a whisper a furlong's distance, it having been already done; and perhaps the nature of the thing would not make it more impossible, though that furlong should be ten times multiply'd... for that [air] is not the only medium. I can assure the reader, that I have, by the help of a distended wire, propagated the sound to a very considerable distance in an instant, or with as seemingly quick a motion as that of light, at least, incomparably swifter then that, which at he same time was propagated through the air; and this not only in a straight line, or direct, but in one bended in many angles. So, obviously Hooke made experiments propagating the sound using a vibrating wire, a kind of sound communication, although his intention most probably was to use it for music transmission. What about his visual communications solution? 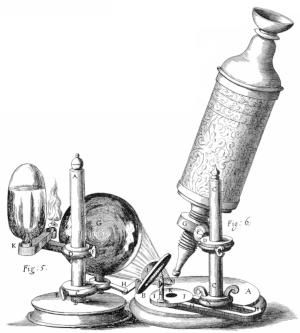 Hooke was an ingenious inventor (he was considered as the greatest meckanick this day in the world) with a host of novel ideas covering a wide range of scientific instruments, including microscopes (see the nearby drawing of Hooke microscope) and telescopes (he built the first reflecting telescope in 1673). Hooke demonstrated his great interest in telescopes, proposing a giant telescope to be erected in Gresham College and making a sketch of this. He also invented a lens-grinding machine (although it was apparently never built), to be used for very large lenses, and proposed a design of a folded telescope with mirrors that would allow a very long focal length, but not be as cumbersome. He invented an equatorial clock drive for a telescope, which is universally used today to maintain the alignment of a telescope with the stars by turning the mounting to counteract the rotation of the earth. Hooke also invented the iris diaphragm, used today in cameras. As early as 17 February 1664 the Royal Society urged that Mr. Hooke set down in writing and produce to the Council his whole apparatus and management for speedy intelligence, but nothing was forthcoming until 29 Feb 1672, when he proposed a way was for a very speedy conveyance of intelligence from place to place by the sight assisted with telescopes, to be employed on high places, by the correspondents using a secret character... The paper of this proposition, and the particulars of the manner of practicing it, were read, but not left by Mr. Hooke to be registered, but taken away by him. The Council ordered that some experiment should be made of this proposition at the next meeting, and on 7 March a test was performed across the Thames. After the test The contrivance was applauded as very ingenious... [but] the President objected, that the use of it would be often hindered by hazy weather. More than 10 years later, on 21 May 1684 Hooke presented to the Royal Society a lecture about Shewing a way how to communicate one's mind at great distances. He said he had considered this matter some years prior to 1677, ...but being [recently] laid by the great siege of Vienna, the last year, by the Turks, [it] did again revive in my memory. Hooke's apparatus (see the lower drawing) consisted of elevated thin wooden frames, supporting a screen, behind which were suspended deal-board characters with symbols, rigged via pulleys and control lines, and presenting the letters and special signs. At each structure a telescope would be placed allowing the operator stationed at the site to view the communications of the adjacent site. For nighttime use, Hooke proposed a 2x5 array of lanterns disposed in a certain order, which may be veiled, or discovered, according to the method of character agreed on; by which all sorts of letters may be discovered clearly, and without ambiguity. With this equipment Hooke thought ...'tis possible to convey intelligence from any one high and eminent place, to any other that lies in sight of it, tho' 30 or 40 miles distant, in as short a time as a man can write what he would have sent, and as suddenly to receive an answer, as he that receives it hath a mind to return it, or can it write down in paper... Nay, by the help of three, four, or more such eminent places, visible to each other... 'tis possible to convey intelligence, almost in a moment, to twice, thrice, or more times that distance, with a great certainty as by writing. Moreover, confirming the close association between communications and cryptography, Hooke noted that by cruptography (as he spelled it) the arbitrary mapping between symbols and letters permits the whole alphabet [to] be varied 10000 ways; so that none but the two extreme correspondents shall be able to discover the information conveyed. The symbols, to be used in the communication, were selected by Hooke so that the communications could be made ...with great ease, distinctness and secrecy. 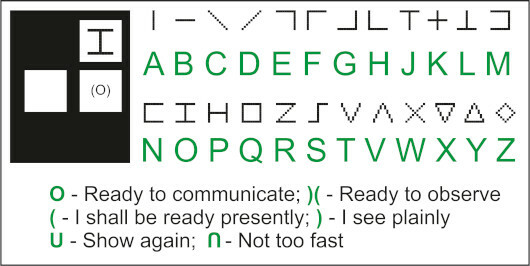 In addition to symbols, representing the letters of the alphabet, Hooke devised single-character control codes to be displayed above the message during transmission, providing eleven examples of these out-of-band signals, to signify special meanings, for example: "I am ready to communicate", "I am ready to observe", "I shall be ready presently", "I see plainly what you show", "Show the last again", and "Not too fast". ...with a little practice thereof, all things may be made so convenient, that the same character may be seen at Paris, within a minute after it hath been exposed at London, and the like in proportion for greater distances; and that the characters may be exposed so quick after one another, that a composer shall not exceed the exposer in swiftness. Robert Hooke had other contributions to the area of computing, communications, and human intellect, which have to be mentioned. First of them is directly connected to the Stepped Reckoner of Gottfried Leibniz. In fact, Robert Hooke was famous not only as a genius scientist and inventor, but being fiercely competitive, he was remembered also with his brutal disputes (not always within the boundaries of fair debate) with his rivals, as between them were some of the greatest minds of his time (and of the whole human history), like Christiaan Huygens, Isaac Newton, and as we will see shortly, Gottfried Leibniz. Leibniz traveled from Paris to London in January 1673, not only with a diplomatic mission, but also on invitation by the Royal Society and its secretary Henry Oldenburg, an old correspondent and supporter of him. On 1 Feb 1673 Leibniz demonstrated his calculating machine to the Society. During the demonstration, Hooke looked carefully at all sides of the machine, and not only examined it in detail, but also expressed a desire to take it apart completely to examine its insides :-). Moreover, only several days after the demonstration, on 5 February 1673, Hooke attacked Leibniz in public (at the same meeting, Hooke attacked also Newton, so it seems he had just an attacking day :-), making derogatory comments about the machine and promising to construct his own superior and better working calculating machine, which he would present to the society. Speaking about the Leibniz's calculating machine, Hooke declared that it seems to me so complicated with wheels, pinions, cantrights, springs, screws, stops, and truckles, that I could not perceive it ever to be of any great use... It could be only fit for great persons to purchase, and for great force to remove and manage, and for great wits to understand and comprehend. In contrast, Hooke announced that I have an instrument now making, which will perform the same effects [and] will not have a tenth part of the number of parts, and not take up a twentieth part of the room. Obviously Hooke kept his word, because there is a record that on 5 March 1673 he produced his arithmetical engine, mentioned by him in the meeting of 5 February, and showed the manner in large numbers, for multiplication or division, one may be able to do more than twenty by the common way of working arithmetic. Unfortunately, Hooke's calculating machine remained as sparsely documented, as his spring-powered model representing one of about thirty different envisioned species of flying machines. The machine was listed among the artificial rarities in the collection of Gresham College in 1681, but then disappeared, leaving no traces behind. It is possible that Hooke's machine was based upon the design of Samuel Morland, because it was said, that he made it in a matter only of a few days. Another very interesting fact is that only a couple of days before the demonstration of Leibniz on 2 February 1673, on 31 January, 1673, Hooke wrote in his diary that he Saw Sir S. Morland's Arithmetic engine Very Silly. It seems, however, the machines of Morland were not that silly :-), and Hooke borrowed some ideas from the multiplication machine of Morland. Interestingly, Hooke also speculated on the physical operation of the human mind, although he didn't go as far as Thomas Hobbes in assigning a material existence to the soul. The operation of the mind Hooke imagined in the form of a coiled spring: There is as it were a continued chain of ideas coyled up in the repository of the brain, the first end of which is farthest removed from the center or seat of the soul where ideas are formed, which is always the moment present when considered; And therefore according as there are a greater number of [layers of] these ideas between the present sensation or thought in the center, and any other, the more is the soul apprehensive of the time interposed. To evaluate the storage capacity of the human brain, Hooke calculated the number of thoughts that could be registered per second, hour, day, year, and lifetime, and take a round sum but 21 hundred millions :-).